I am neither a supporter nor a hater of the Confederate flag, but I am amazed at the knee jerk reactions of people Republican and Democrat who are calling for it's removal since the mass shooting at Emmanuel AME Church in Charleston. The Confederate flag became scapegoat enemy number one merely, because the shooter Dylan Roof was seen in a picture holding the flag. I truly believe all of this is nothing more then a distraction, because the Confederate flag wasn't the cause of what happened in Charleston. If Dylan Roof was seen in the picture holding an American Flag instead, would there still be this knee jerk frantic action to call for it's removal also? I've heard the argument by some who claim that the Confederate flag is a symbol of "racism and division", however there are just as many people in America especially on the left who would say the exact same thing and have about the American Flag. I believe the issue for the Confederate flag's removal should be left exclusively to the people who live in the states where the flag flies at the state houses and public buildings. I'm not the only black person who see this so called controversy as a distraction. Thankfully other blacks are smart enough to realize that whether the the flag flies or not has no impact on their lives nor address the real internal issues facing the black community. Pure unspeakable evil strikes and kill 9 people in Charleston South Carolina Church. I was up late, and I decided to check out the Drudge Report just to see what was happening. At first I thought I was misreading the red headline banner, but unfortunately it was correct. Nine black church goers were killed in an historic church in Charleston South Carolina. 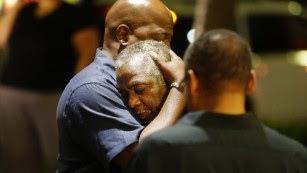 A survivor reported white male in his 20's entered the Emanuel African Methodist Church in Charleston and opened fire on the people who were in the church for a prayer meeting. The gunman fled the scene. The Charleston Police has labeled this horrific act as a "hate crime". The pastor of the church Clementa Pinckney who is also a South Carolina state senator is missing. The investigation has just started, and a huge manhunt is underway for the suspect. This could be a racially motivated massacre, but we will have to wait and see. 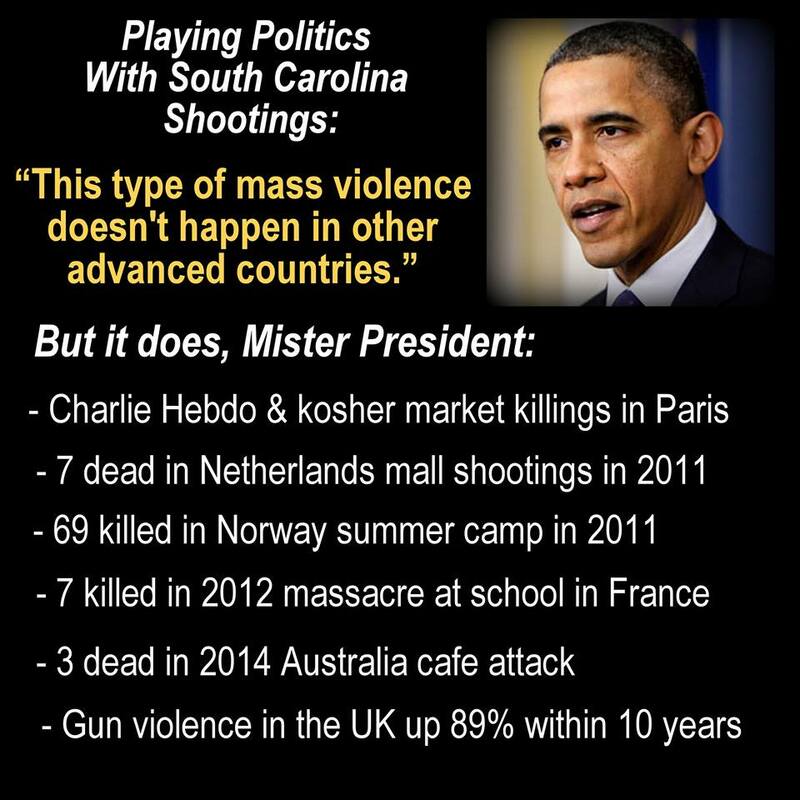 I have been reading comments by fools already trying to claim that the shooter is a member of the NRA. I'm sure by sunrise, the shooter who nobody knows yet will be labeled as a "tea party, right wing Republican who wears an I love Fox News Tshirt" again without no facts. Look or grandstanding progressives to immediately call for "gun control" legislation in wake of this event. I've been reading mindless stuff from both black and white racists who have been calling for a "race war" in America for years. The only people who would even entertain being involved in such nonsense are the most fringe elements of either race.Obama is going to comment on this tragedy and for once he should based on scope of what actually happened. I just have zero confidence in him that he will even come close to saying the right thing in order to calm any racial tensions that might have arisen over this and ask for a wait and see on what happened. Since this is a late breaking story, I will have more to say on this horrific act that is basically terrorism in Charleston. Thankfully South Carolina has the death penalty and hopefully it will be put to use, when this person is caught. 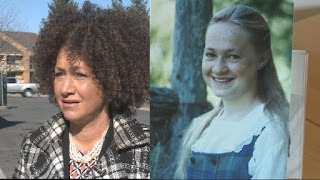 Spokane Washington's NAACP leader Rachael Dolezal was black before she was white or is that vice versa? Jeepers Scobby!! The mystery of the racial identity of the Spokane Washington's NAACP President Rachael Dolezal has been solved!! 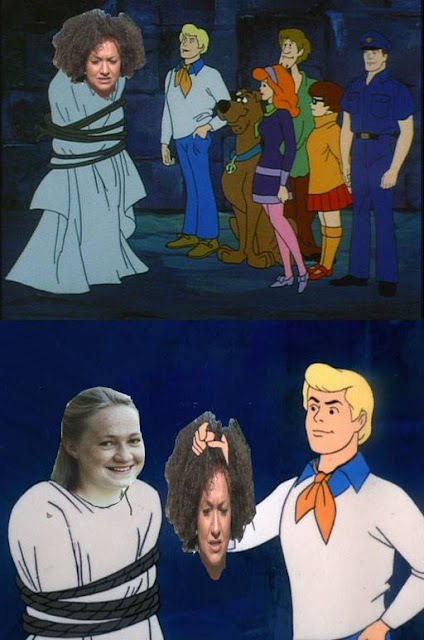 Rachael Dolezal would have gotten away with it if it weren't for those darn meddling kids or in her case her parents. Many on the right have said for decades that liberalism is a mental disorder, and I guess that would include the disease of progressive "white guilt". Ms Dolezal once said back in 2010 that "She could not imagine "showing her face" at at tea party event", she continued "to her what stands out is the "all white crowds"!! So a mentally screwed up white woman trying to pose as being black would have been nervous going to an event she perceived as being all white? 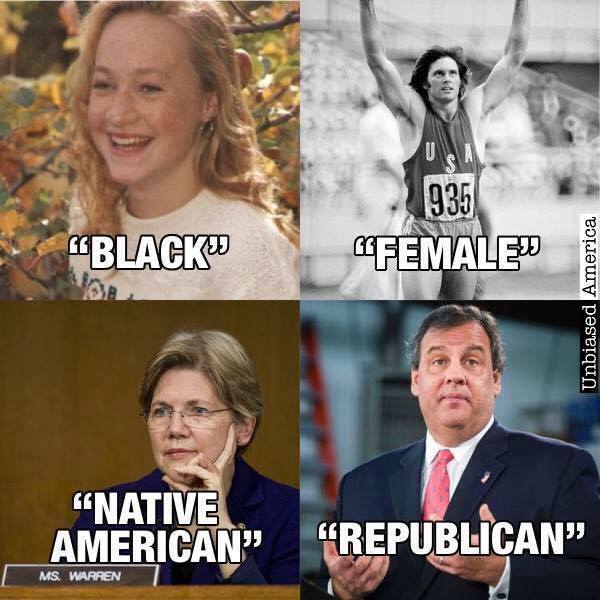 With liberals, the truth seems to always be stranger then fiction. I've documented the lunacy and sheer insanity of these people for a long time, but this takes the cake and the pie!! I suppose if Rachael Dolezal ever did attend a tea party event as "herself", she could be said to be going maybe "incognegro". So will the Spokane Washington NAACP be renamed as the NAAWWPAB short for the National Association for the Advancement of White Women Posing As Black? I wouldn't be surprised if Rachael's biological parents who are both white are attacked by liberals for ratting her out and stating that she is indeed white. Let's face it, in the whacked out progressive fantasy land known as their warped reality, logic doesn't have to make sense, it just matters what feels good to them or what they can identify as even though they are not. In the world of progressive logic, it would stand to reason that Ms. Dolezal will keep her job as the Spokane's NAACP leader, because the NAACP board and other progressives would claim that "her heart was in the right place", her obvious mental illness won't even play a factor. White Beach goers are ground zero for black people being killed, who knew?! I've been meaning to post this story over the Memorial Day weekend. The stupidity factor of the people involved was screaming for me to post this. There is no denying that black lives truly do not matter. Just ask the number one undisputed cause of black homicides in America. That would be young black males. The truth can hurt, but it's still the truth. I would like to know what element is more deadlier to the black community, a) high blood pressure, b) diabetes or c) armed young black males. When I find out the answer I will be sure to let everybody know, because I am truly curious about the answer myself. Anyways, on Memorial Day Weekend in Coney Island New York a group of protesters decided to storm the beach in order to make a rather bizarre and utterly stupid statement to beach goers. "Stop Killing Black People"
I've said for a long time now that progressives are truly dopey people who haven't gotten the message. These days it would seem that the Westborro Baptist Church has some serious competition in the category of most clueless and deranged protesters. 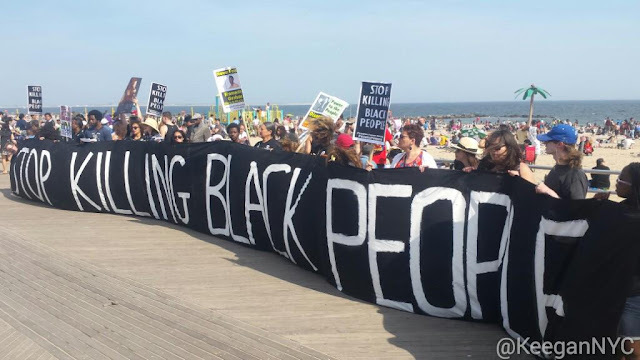 If a survey was taken by the beach goers the day these misfit protesters decided to show up and make fools of themselves whether or not any of the white people have ever killed any black person, it would be a very good chance that the survey would come back blank. Now of course I or anyone would be frowned upon for daring to ask the very obvious question, "Why don't blacks use that banner in the areas where blacks are actually dying, which would be in black inner city neighborhoods. Nah, that would make too much sense for them to do the obvious and actually address the true issue. That banner is sorely needed here in Baltimore but it will never arrive or obvious reasons.